Transcribing is the process of putting your shorthand into longhand written form. Usually it involves typing it up. It could be on a computer, typewriter or even in longhand with a pen and paper. Most of the time you will be taking dictation (which is writing down what someone is saying). So the original will not be in written form. Shorthand helps you write down as much as possible and maybe all if you get fast enough. Since most people can't read shorthand, or your version, it needs to be written in a language that the majority of people can understand. 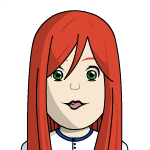 *she is sitting correctly and comfortably. 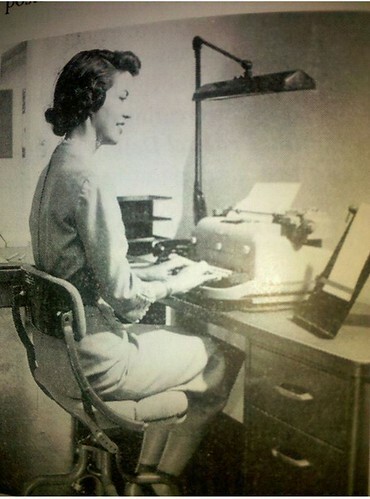 You will read your shorthand notes with the simultaneous transcription of them upon the machine [typewriter, computer, tablet, etc]. To get the best results, it will be necessary for you to glance through a sentence before beginning to put it on the machine, in order that you may properly punctuate it [remember this was before you could easily go back and correct like on a computer or tablet, but it's nice to get it right the first time]. If you do not use the touch method [keyboarding without looking at your fingers], just before you write on the machine, the last three or four words that you have in your mind, glance at your note-book, still keeping the machine turning take up another sentence and write that. By this plan you will save time, and gradually as you train yourself you will find that you can remember more and more and will be able to write longer stretches without glancing at the keys, until at length you can carry three or four lines of shorthand matter in your mind, and keep the carriage of your machine traveling without a moment's cessation. Herein lies the real utility of the touch method--the ability to keep the machine constantly moving. From Practical pointers for shorthand students. If you need help with your typing, there is a archive typing book from 1902 that you can use and it will work today, except parts like the "carriage" or using the lower case letter 'l' for the number 1 (one). The part about not correcting errors is a good idea until you learn to type accurately. The "backspace" key is easy to use now days and you may be familiar enough with it, but while learning and doing drills, try to avoid it. Keep the mistake so you can learn from it. It talks about a "top bank of keys" similar to this typewriter, ignore that part, of course. We now use the shift key. Starting to transcribe your notes early is essential. In an actual class I took for SpeedWriting (an alphabetic shorthand), we transcribed almost immediately. Within the first few lessons. You can do this with any Anniversary manual. Even if you're not writing the Functional Method version yet, or not even writing yet, transcription will help you learn the shorthand characters better. Typing makes you think of the word more then just reading. Even if you're a fast, accurate and just copy type (not even reading what you're typing), you need to see the word that's in shorthand and decipher it in longhand before you can type it in longhand. You may want to time yourself transcribing. This will help you learn to read your shorthand notes quicker. You will also see where in your typing you need improvement. If needed use something like Notepad or remove the grammar and spelling. This will also help you learn. If you're doing the Functional Method where you read prior to writing, you can use the textbook. Open the textbook to a place you have studied (could be the first lesson when you're on lesson two). Start typing up from the shorthand section (reading or reading and writing exercises). Compare your notes to any key or review them with the shorthand textbook. This is great practice from any book with shorthand written on them. Of course transcribing your own notes is the best, so you can see if you've made any errors or need to study anything else. Do some transcription. You want to be able to learn to read your handwriting. Just as in longhand, sometimes others can't read your writing or you might find years from now unable to read it. Taking classes or notes in meetings in shorthand may change your shorthand, just as it does longhand. Of course, not using shorthand for years, will also change your handwriting (shorthand and longhand). When you use a computer, speech to text, photographs, etc., instead of using a pen and paper, you will find your handwriting changing. You may even adopt some letters from fonts you use often. If you are short on time, transcribe what you can. Try at least once a week if not more. When I took Speedwriting Shorthand in a night class, I had to transcribe EVERY lesson. Every word I wrote was typed up (yes, typed, on a typewriter). This course was similar to the Functional Method with a lot of reading and writing. The small brown Anniversary manual is short enough you could. If you're using the FM manual, then you wouldn't even write shorthand until later in the manual. So you are welcome to use the suggestion above about transcribing from the book until you write shorthand. As I said above, I had to do ALL of it. But, I won't require that of you. It does help immensely, so I say, do as much as you can. Use one of your homework times to just transcribe. If you have extra time, go back a few lessons. Transcription uses your brain in a different way. Not only are you reading a different "language" and translating it, you're also relying on your mind to recall all the English you've ever learned. Transcription will build your grammar, language, punctuation, etc., in a way ordinary typing or writing doesn't. I learned that. I can type longhand straight copy easily without thinking much about it or the way I type or where my fingers go. I can even type up the same things over and over without much thought. But when typing from shorthand, I have to think if the word is "there, they're, their". You know you write shorthand by sound (mostly). But you will, of course, not transcribe by sound. For example, you write the "sh" symbol. Possible "sh" translations: sh, ish, ush, tion-sion-cian, tail-cial-sial, tious-cious-ceous. So you will need to pay attention to your spelling and grammar as you transcribe. If you've ever wondered why notebooks or stands are placed on the left side, this is why. 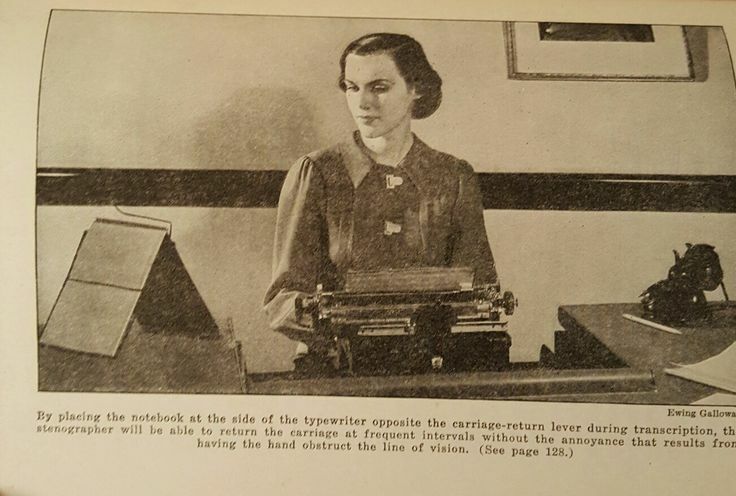 By placing the notebook at the side of the typewriter opposite the carriage return lever during transcription, the stenographer will be able to return the carriage at frequent intervals without the annoyance that results from having the hand obstruct the line of vision. Sometimes it'll take more then one time to get all the correct words. If you know you have the wrong word because spell check doesn't come up with an actual words and Google has no results, think it through. When you're transcribing sentences, it's a little easier. But still be careful. Transcribing includes common sense. If the words work, if it seems right, grammar and spell check shows no errors, and it makes sense. However you know that something is off. See if an outline or two can be something else, another word or even as phrase. If one sentence seems of our is obvious incorrect, use common sense and go back to your shorthand notes.